Predatory lending and predatory-employment practices are squeezing workers of color at the world’s largest hotel company. When more than 7,000 workers at Marriott hotels walked out on strike in October, their demands centered on wages and working conditions. Among the concerns are fluctuating hours and unpredictable paychecks for the company’s predominantly black and Latino employees. But behind Marriott’s employment practices lurks another source of economic insecurity: an affiliated credit union that is supposed to operate in employees’ best interests. Even as Marriott cuts worker hours and fails to pay a living wage, the Marriott Employees Federal Credit Union (MEFCU), officially independent but led by Marriott International executives—is pushing short-term, high-fee loans as a way for workers to cope with the income instability that Marriott itself is creating. The promise is seductive. When paychecks fall short, workers can take out a loan to pay the bills. Yet debt is seldom a sustainable way to make ends meet, especially when loans come with high fees. Data from the National Credit Administration show that MEFCU brings in more in fees for every dollar loaned than any other credit union of its membership type, charging $11 in fees for every $100 loaned, substantially more than its peer institutions. The result is a debt trap that, as a recent New York Times exposé of the credit union documented, can drain the bank accounts of unwary workers nearly as fast as a paycheck can fill them. The combination of predatory lending and predatory-employment practices has a historical precedent in the sharecropping system that kept formerly enslaved black families in the South trapped in a cycle of debt. Since most sharecroppers did not have a steady cash flow, they used their prospective crops as collateral to finance loans from the country store, a merchant who faced little competition and could therefore set interest rates as high as 50 or 60 percent. White store merchants and landlords built their own wealth on a system that left predominantly black sharecroppers in perpetual debt. Like that system, Marriott’s employment instability and its credit union’s high-fee loans are fueling growing racial inequality. Indeed, Marriott’s mostly black and Latino front-line workforce may be particularly vulnerable to high-cost lending at MEFCU because of the long history of families of color being excluded from the wealth-building opportunities that have benefited white families. As a result, people of color remain less likely to have savings to fall back on when work hours are cut. They become more exposed to predatory lending, which in turn strips additional resources from families and communities, further increasing their reliance on borrowing in the future. Now MEFCU does offer some employees an opportunity to build wealth. Higher-income, disproportionately white employees (including Marriott’s executives) can access a favorable home-mortgage loan. According to data released in accordance with the Home Mortgage Disclosure Act, 59 percent of black applicants were denied a home loan from MEFCU between 2011 and 2017—nearly double the denial rate of white applicants. Black applicants only received a total of 12 home loans from MEFCU during the six-year period, which amounted to just 6 percent of the total home-mortgage dollars loaned by the credit union. Moreover, even among wealthier applicants—those making more than $100,000 annually—black applicants were denied twice as often as their white counterparts. The disparities do not necessarily mean that MEFCU is deliberately discriminating against black applicants but rather that the credit union’s everyday corporate practices reflect existing racial inequality—and in the process, amplify it further. The good news is that Marriott workers have their own plans for disrupting the cycle of debt and disadvantage. As they realize that joining together in a union is a more effective way to secure adequate income than taking out a high-fee loan, their strike continues to build strength. 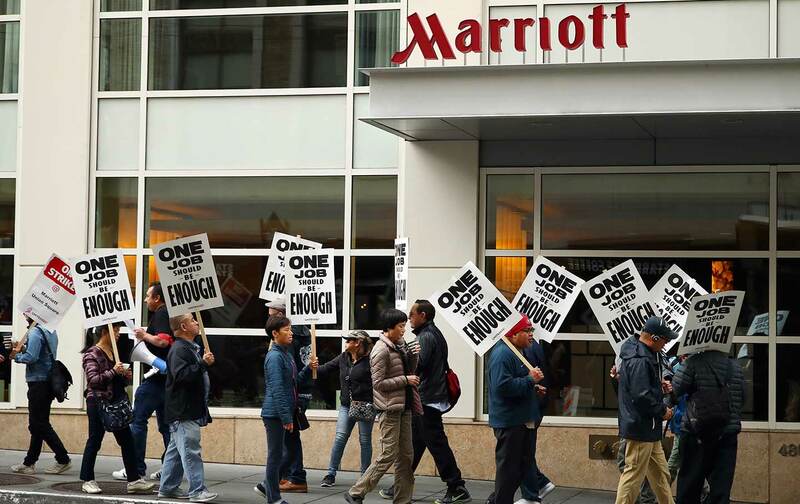 Their rallying cry, “One job should be enough!,” sets forth a different path for Marriott, one based on fair wages and stable schedules for workers of all backgrounds rather than wealth-stripping debt. Facing criticism, Marriott executives have already made a concession: They will ask MEFCU to reassess its fee structure. But this first step is hardly sufficient. The world’s largest and wealthiest hotel company can—and must—enable the working people who make it profitable to earn a good living and build the wealth that will provide a real future for their families. The picket lines will stay up until they do. Amy TraubAmy Traub is the associate director of policy and research at Demos.